Pralognan-la-Vanoise, usually shortened to Pralogan or even Pralo’ is a “gateway” to the Vanoise National Park. The village nestles amongst the high Alpine peaks of the Vanoise with the culminating peak, the Grande Casse (3855 m) close by. The village is at an altitude of 1400m. Whilst there are a few ski lifts Pralognan keeps it’s village feel; village first and resort second. Pralognan is in a cul-de-sac with only one road in from the valley of the Tarentaise. 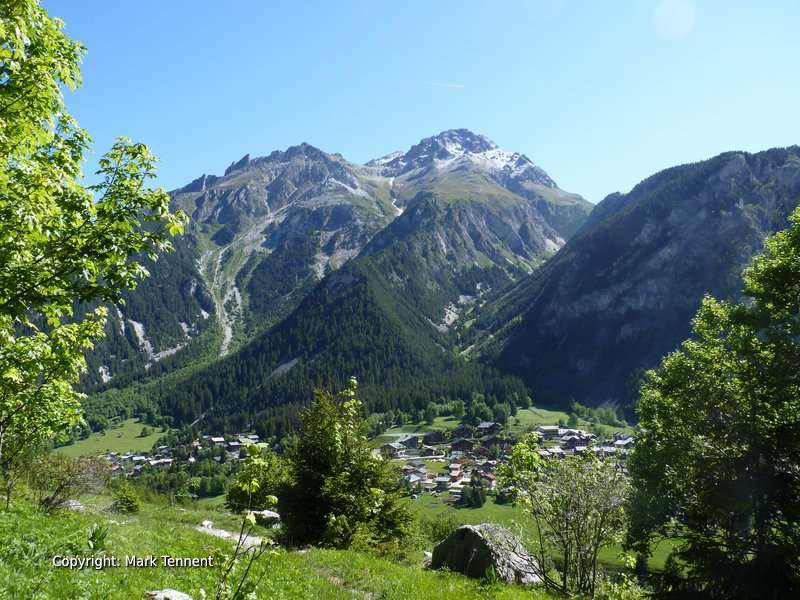 To reach Pralognan you drive from Albertville up the Tarentaise valley to Moutiers. From here the road leads up via Bozel passing turns for the big, monster ski resorts of Meribel and Courchevel. Keep straight on and the road zig-zags up before you arrive at the village. There’s a range of local services for the visitor, hotels, appartments and campsites. Higher up there are mountain refuges too with those in closer proximity accessible to most willing to make a short walk. Pralognan makes an ideal base to explore the Vanoise. The Tour des Glaciers de la Vanoise sets off from the village following the ancient Route du Sel to the Col de la Vanoise (2517 m) passing by the picture postcard Lac des Vaches. Two Grande Randonnée (long distance walks) pass through, the GR5 on it’s way from Lake Geneva to the Mediterranean and the GR55. Following the river Doron de Chaviere you can either walk, drive or take the “navette” (free local bus) to the car park and end of the road at the hamlet of Prioux; only open in summer. Here you can also enjoy a meal or drink at one of the café / restaurants. To go further it’s on foot only and a short walk can take you to the refuge of the Roc de la Peche. For those going further you can continue to the alpine farm at Le Ritord and on to the Refuge Peclet-Polset. Beyond the Refuge Peclet-Polset are the azure waters of the Lac Blanc nestling below the Col du Soufre and you can make out the edge of the Glacier de Gebroulaz. Another option is to head on to the Col de Chaviere (2796m) that is one of the highest cols on a Grand Randonnee. The Col d’Aussois gives access to the Maurienne valley and a short detour to the Pointe de l’Observatoire gains the magical 3000m point. Further on along the ridge is the dramatic Point de l’Echelle. Rock climbers can find short routes close to the centre of Pralognan but if you want long mountain routes you are spoilt for choice. Try the Aiguille de la Vanoise, the “shark’s fin” of a mountain dominating the Lac des Vaches. A short walk from the village centre is the Cascade de la Fraiche an impressive waterfall that thunders down between steep rocky walls. It’s the location for a great via ferrata that goes by the same name. The route starts on the left (looking up) and follows an edge that depending on the water level in the stream is sometimes bathed in a cooling spray from the waterfall! The most memorable part is crossing high above the waterfall on two steel wires to gain the other side. The route finishes up more steep rock before finishing amongst pine trees in the shade. A great couple of hours on a hot summer’s day! A good path leads back to the village. The Hotel Le Grand Bec *** at the entrance to the village is family owned and you can be assured of a warm welcome and excellent food. To relax there is an outdoor pool and inside another pool, sauna and jacuzzi. Previous Post: « How are Via Ferrata graded in France?